VIDEO: Fireworks aplenty in the Oval Office as Pelosi and Schumer meet with President Trump, demanding meeting be private. Prez keeps the cameras rolling! Fireworks in the Oval Office! 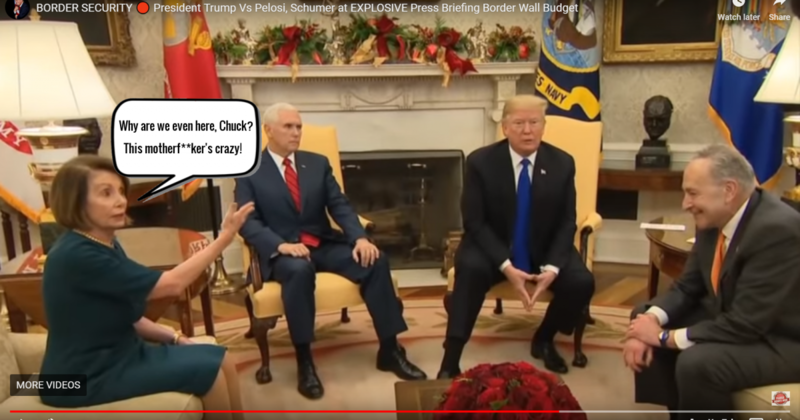 Nancy Pelosi and Chuck Schumer visited the White House today for an informal meeting with President Trump, or so they expected it to be informal…. and private. Not so much! It was informal enough but it certainly wasn’t private with the White House Press Corps on hand to record the fun, much to the dismay of the Democrat leaders, who continually called for a private meeting without the cameras and microphones, no doubt so they and their pals in the mainstream media could spin the meeting as they saw fit. The major point of contention during the discussion was the border wall, specifically the wall’s funding. The Democrats want to fund a fraction of the $5 billion President Trump is requesting so that little progress can be shown on the wall by year’s end and they can then call the president a liar who breaks campaign promises. In my opinion, President Trump should forget about the House funding the wall at all. He can easily have the Army Corps of Engineers build the wall and fund it from the existing defense budget. There! Border security! Forget about the anti-American Democrats! Done deal! And, can someone tell me why Mike Pence was even there? He contributed nothing to the meeting and at one point appeared to be asleep. He and Rep. Batshit Crazy want a "private" meeting so they and their pals in the mainstream media can lie and spin the meeting to their liking. If I were the president, I would demand ALL meetings with these slimeballs be public so that there are millions of witnesses.